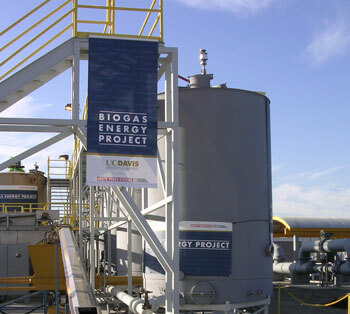 The Propane Education & Research Council recently joined the University of California-Davis, Onsite Power Systems, and industry partners at the official start-up of the anaerobic biodigester system for UC Davisâ€™ Biogas Energy project. The project will demonstrate an innovative waste-to-energy technology with possible environmental and economic advantages, including potential as a renewable energy source. Anaerobic biodigesters use bacteria to break down animal waste, plant material referred to as green waste, and food waste and convert it to biogas, a form of methane. The UC Davis / Onsite Power biodigester also produces raw hydrogen in its two-step process. The hydrogen can be marketed as a fuel source for use in fuel cells or motor vehicles and sold as an industrial product. The biodigester can produce an estimated 22 therms of high-quality biohydrogen and biogas from one ton of food waste or green waste. The Biogas Energy projectâ€™s biodigester uses the propane-fueled boilers donated by PERC to sustain internal heat at the required temperature to promote optimal bacteria growth to produce the most efficient natural breakdown of wastes. Propane also can serve as a reliable backup energy source for the types of biodigesters that run off of their own energy production. ~ What Is the Meaning Of Biogas ?